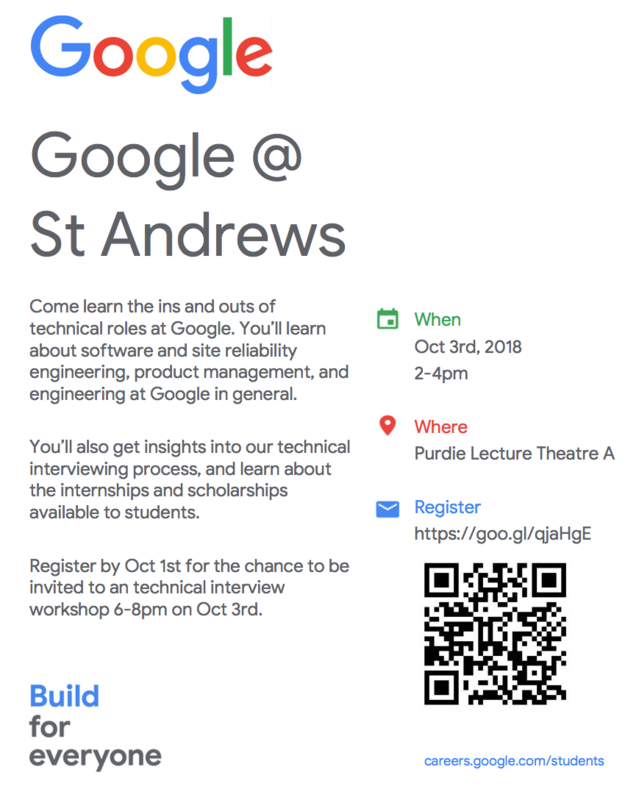 Next Wednesday, October 3rd between 2 and 4pm, Google will be hosting an event at St Andrews. 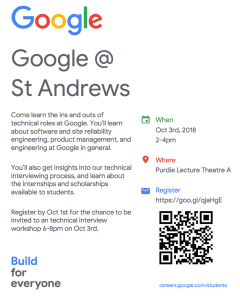 Come along to the Purdie building (Lecture Theatre A) to learn the ins and outs of technical roles at Google. You’ll learn about software and site reliability engineering, product management, and engineering at Google in general. You’ll also get insights into the technical interviewing process, and learn about the internships and scholarships available to students. Register by Oct 1st for the chance to be invited to an technical interview workshop 6-8pm on Oct 3rd. Alumni Paul Dobra will host a short session about Salesforce graduate opportunities on Friday the 8th December, at 11am in Jack Cole 1.33. Target audience MSc, MSci and Honours students. Congratulations to second year students Katerina Saranti and Tatiana Matejovicova, both have successfully secured Google STEP Internships with Google, in Zurich. A fantastic achievement given the highly sought after summer engineering projects and the competitive process involved. Katerina had originally applied for a Google Anita Borg scholarship last year. She had intended Interning at a natural speech recognition company, before being contacted by a student development specialist from Google who encouraged her to apply for a STEP internship. Katerina shared some of her thoughts on the interview process. “After the Christmas holidays, a Student Development Specialist at Google emailed me asking me if I would be interested in applying for a STEP internship as my profile from the Anita Borg application seemed a good fit. It took me by surprise but I was thrilled of course and I spent the next few weeks preparing for the technical interviews. I feel that all CS modules helped me for the interviews, but I found the most relevant module to be CS2001 as it focuses on data structures which are especially important for the interviews. Also crucial to my preparation was solving lots of coding problems by hand, without using an IDE, since during the interview I had to write out everything myself, without the help of auto-complete or the compiler’s complaints about my errors. Thanks to Silvia and Katerina for sharing their experience in an inclusive and informative way, and in doing so encouraging other students to seek out internships. 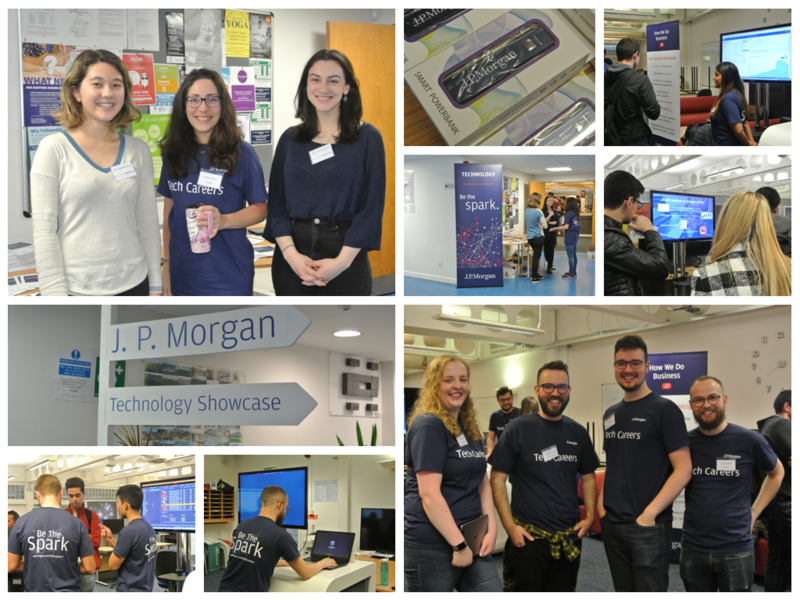 We have supported a number of student led, or internship focused events in the last year including the Academic Skills Project and look forward to hearing more about the 2016 STEP internships at future events. 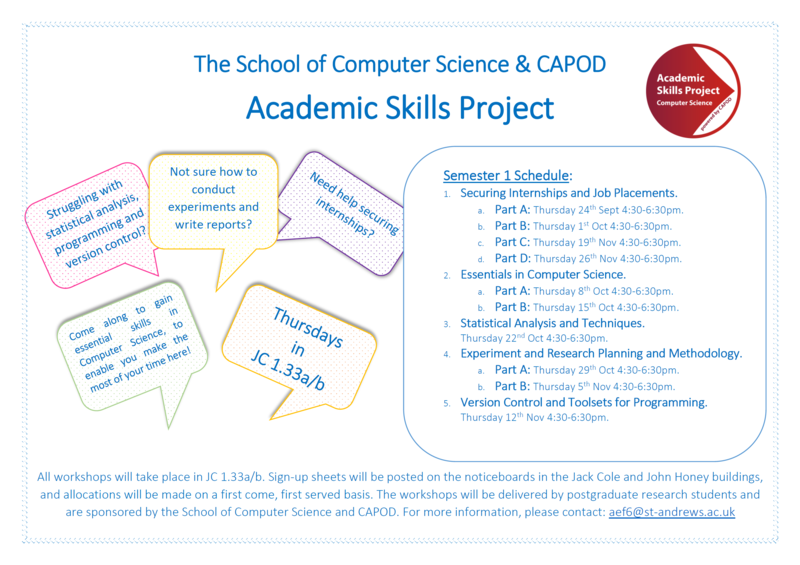 Adeola Fabola (one of our PhD students) is coordinating the Academic Skills Project (ASP) in the School of Computer Science for the 2015/2016 session. 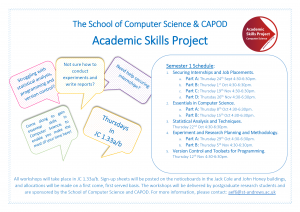 The ASP is a scheme managed by CAPOD, and run by postgraduates, designed to deliver discipline-specific skills and tailored workshops. Yesterday afternoon the first informative and lively workshop, Securing Internships and Job Placements , attracted in excess of 100 students. After an introduction to the internship recruitment process, and tips on enhancing your required skills and CV, some of our Honours and PhD students shared their internship experiences. Workshop participants heard from Shyam Reyal, Peter Josling, Robin Nabel (Google), Simone Conte (Adobe), Ilia Shumailov (Microsoft, JPMorgan Chase), Maria Kustikova (Soliton Systems) and Nick Tikhonov (Amazon). 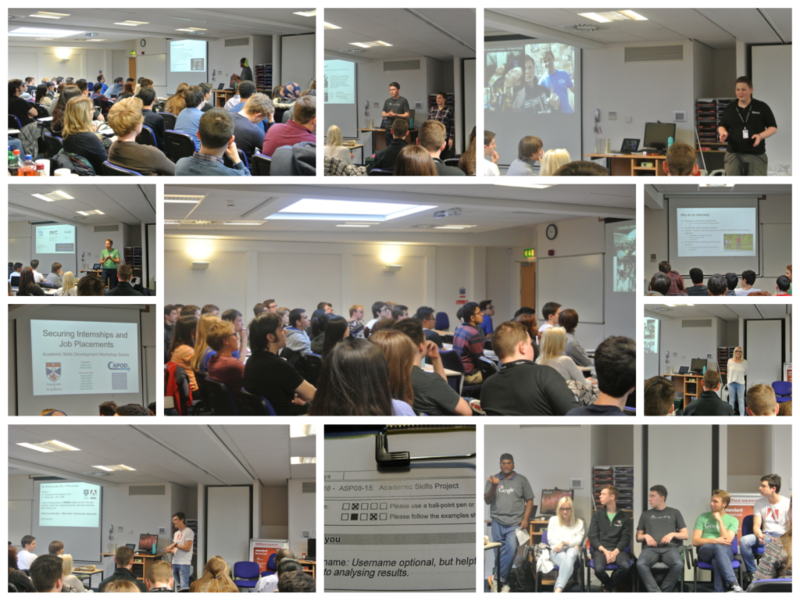 The workshop session included a panel discussion and Informal networking session. The slides used during the first workshop are now available, you can also sign up for next week’s workshop and remember if you missed yesterday’s session, you can still benefit from the next events. Thanks to Ade, Shyam and all the panel members for running a great event for the CS student community.